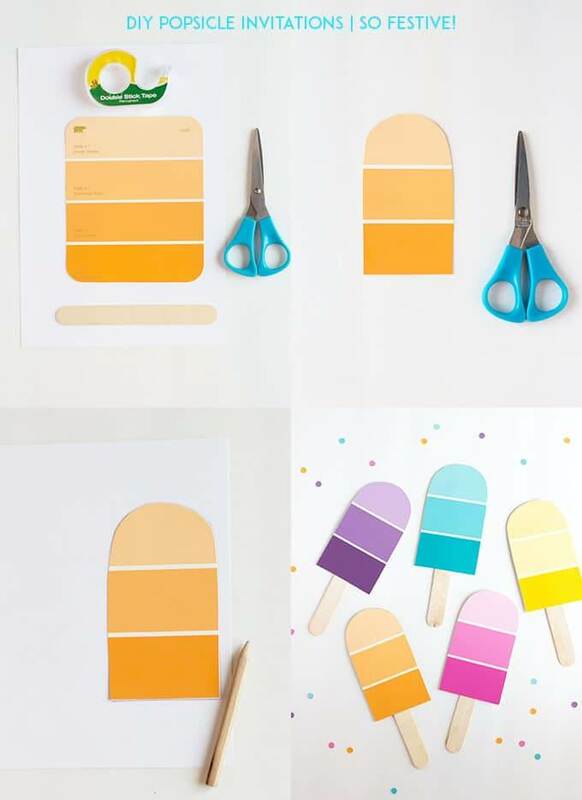 DIY Popsicle Party Invitations - So Festive! 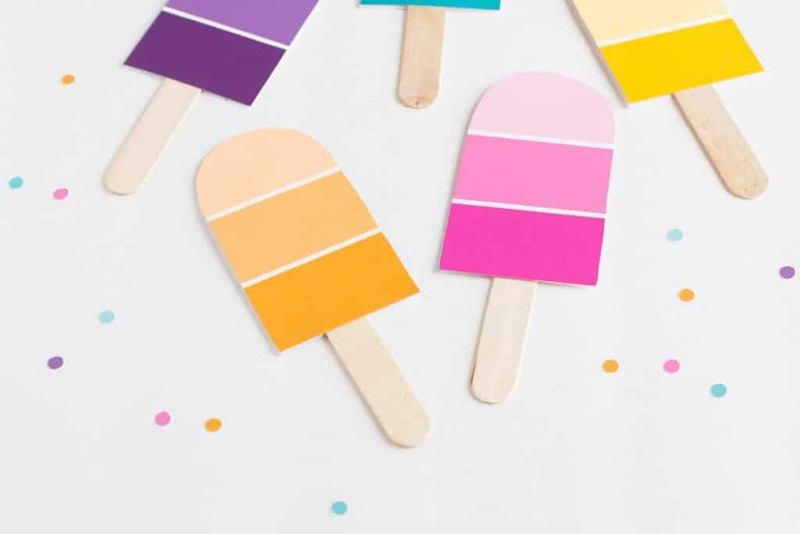 Adorable DIY Popsicle party invitations are so easy to make with just a few supplies. Use them for a summer party or as a fun summer craft for the kids! Kick off summer with a popsicle party! Round up your neighbors or your children’s school friends and throw a party. Go all out and have play some fun backyard water games or you can keep it simple by just eating popsicles on the last day of school. But you’ll need a way to tell everyone about this fun shindig that is happening…and that’s where these super COOL popsicle invitations come in. 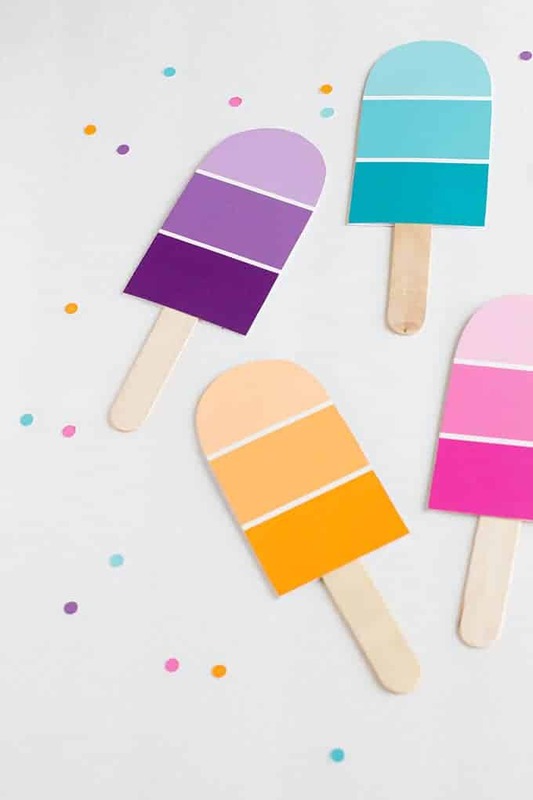 You can easily create these DIY Popsicle Party invitations in just a few minutes. And you’ll only spend a few pennies on them. Even better! They are easy enough for little hands to help make, but cute enough for all ages. 1. The first step is to pick our some paint samples. I used wide Behr samples from Home Depot, but just keep your eye open for any wide paint samples the next time you’re at a home improvement store. 2. Simply draw out a popsicle shape on the back of the paint sample. Then cut it out. 3. Trace the shape onto white card stock paper and cut. You can skip this step if you are not going to make an invitation. For crafts only, you only need one side! 4. Tape the 2 sides together and slide a jumbo popsicle stick in the middle. 5. If you are going to have a party, write or print all the party details on the back of the popsicle invitation. Now you’re on your way to one super COOL party! 8 Birthday Gifts under $4! I got the Behr paint samples from Behr and just sat down to make these with my daughter and just noticed that Behr puts the logo and name in the middle of each strip now! Not on the side like you had… wow… not sure what to do now. I wonder if you met with that problem yet? What’s your solution? Oh no! I didn’t have that problem when I made them. The logo was on the side so it was easy to cut out. I guess the only option is to find samples that don’t have the logo in the middle! I’m so sorry. Let me know if you figure out a better way!